Bearing in mind that much of the new computing programme of study expects non-specialists (and I suspect a few specialists…) to teach at least some things many are unlikely to have been taught, either at school or when training to teach, Computing at School commissioned me to write a short guide to the new curriculum, addressing subject knowledge as well as planning, teaching and assessment for computing. With much helpful feedback and editing from friends in Havering School Improvement Service, Rising Stars and elsewhere this is now done – a copy has been posted out to each English primary school and it’s free to download from CAS’s site. Very pleased that it also received Naace’s endorsment. This is a really exciting time to be a pupil at primary school. The opportunities that advances in technology will bring to your pupils as they grow up are hard to imagine. The curiosity, creativity and courage that you nurture in them now should endure as they move on through education and into adult life. To exploit fully the opportunities that current and future technology offers them, pupils will draw on the understanding of computing you provide them with, as well as confidence gained through working on a range of meaningful projects throughout their primary education. It’s a really exciting time to be a primary school teacher, too. 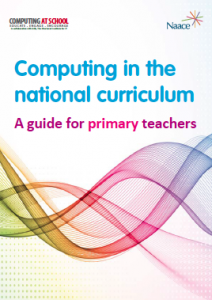 Don’t be daunted by the changes in the move from ICT to computing. Rather, see this as an opportunity to develop your own knowledge about computing and to learn to program, if you’ve never had the chance before. Although this might sound like hard work, it’s actually great fun. You’ll find that you make better use of the technology you have at home and in school, and also that you start to think a bit differently, looking at systems and problems in the same way a computer scientist does.